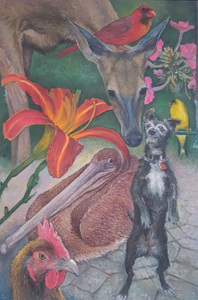 This year Putnam Arts Council Members' Show will end on Sunday April 7 with a special event. The exhibiting artists and public are invited to an Artist's Walk and Talk. Each artist will be invited to spend a few minutes talking about their own work on display. It will be a wonderful opportunity for the member artists to get to know one another and share personal insight into their process and background. The event will include a gallery tour with the artist on hand. The gallery hours are 2-4pm and the event will begin at 3, in the A. Eric Arctander Gallery. At the end of the discussion artists will be able to take their work home (unless it sells). Participation in this event is up to you; no pressure.